Once publicly opposed to UPA’s flagship employment guarantee programme, Rajasthan Chief Minister Vasundhara Raje has now turned to the scheme to help rural labourers and farmers affected by unseasonal rains and hailstorms earlier this month. The BJP government in the state has decided to provide additional man days until March 31to people in rural areas who have already completed 100 days of employment under the Mahatma Gandhi National Rural Employment Guarantee Scheme (MGNREGS). 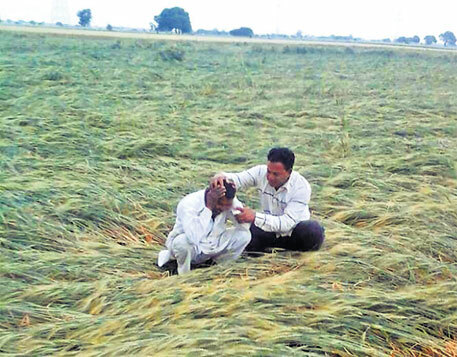 Farmers in 26 of Rajasthan’s 33 districts are estimated to have suffered losses. Last year, Raje had stirred a debate by saying that rural employment be given under schemes without the legal backing of an Act. The latest measure, however, is unlikely to provide substantial benefit to those affected. While the decision was taken on March 19, the official notification was issued only four days later. This has brought down the number of man days until March 31 and will reduce the potential earnings of labourers. Government data shows that only 6 per cent of 4.1 million eligible households got 100 days of jobs. This means around 0.21 million households in 26 districts are eligible to benefit from the additional man days.